This is from Jully 2012. நமது மாநில அமைப்புச் செயலர் தோழர் N. அன்பழகன் அவர்களது துணைவியார், இன்று 21/06/2012 மாலை ஏழு மணியளவில் இயற்கை எய்தினார் என்பதை அறிவிக்க வருந்துகிறோம். 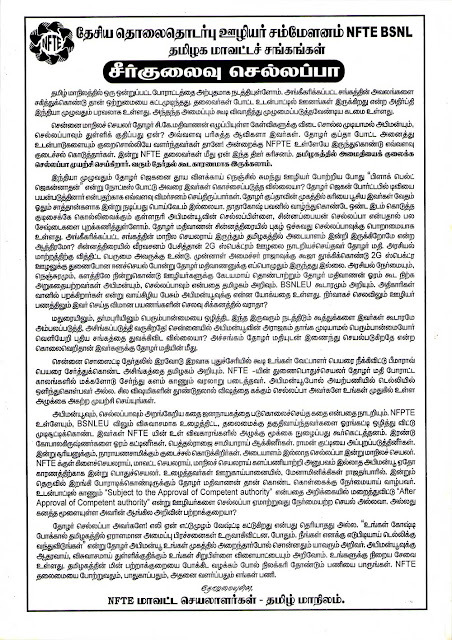 இறுதிச் சடங்குகள், 22/06/2012 அன்று மாலை நடைபெறும். மனைவியைப் பிரிந்து வாடும் தோழருக்கு மாவட்டச் சங்கம், தனது ஆழ்ந்த இரங்கலைத் தெரிவித்துக் கொள்கிறது. Strike is deferred. Settlement reached. Details follow. Forum of BSNL Unions/ Executive Associations talk with CMD BSNL failed - Let us prepare for the Strike: In response to Dy. Labour Commissioner directions, CMD BSNL hold a meeting with the representatives of Forum of BSNL Unions/Associations at 4.00 PM in BSNL Board Room to discuss the demands w.r.t proposed indefinite strike w.e.f. 13th June 2012. CMD briefed about the financial condition of BSNL and mentioned that at present it is not possible to consider Forum demands, viz., implementation of 78.2% IDA fitment benefits & revision of allowances as per 2nd PRC recommendations. After the meeting, representatives of Forum of BSNL Unions/Associations met and decided to successfully implement the indefinite strike from 00.00 hours of 13th June 2012. The leaders of the Forum of BSNL Unions/ Executive Associations will meet again by 12.30 hours tomorrow to discuss about the strike scheduled to begin at 00.00 hours of 13.06.2012. 11-06-2012 : Conciliation meeting held today: Dy. CLC held conciliation meeting on 11th. Comrades Islam and A. Raj Mouli attended the proceeding on behalf of NFTE BSNL. Dy. CLC has advised another meeting with the management on strike demands. Meeting with management on dt-11-06-2012 at 1600 hour. ஊழியர்களின் கோரிக்கை என்று வரும்போது, சிக்கனம், பொருளாதார நெருக்கடி பற்றி பேசும் BSNL நிர்வாகம், I.T.S அதிகாரிகளுக்கு, ரூபாய் 1300 கோடிகளுக்கு அலவன்ஸ்களையும், சலுகைகளையும் வாரி வழங்கியுள்ளது. அனைத்து கிளைச் செயலர்களும், இந்த போராட்டத்தில் பெருவாரியான உறுப்பினர்களுடன் கலந்து கொண்டு, போராட்டத்தினை வெற்றி பெறச்செய்யுமாறு கேட்டுக் கொள்கிறேன். Recently, the Government of India decided that BSNL should install mobile equipments and towers in specified districts of states like Chhattisgarh, Jharkhand, Orissa etc., which are affected with Naxalite activities. These parts of the country, are hilly, forest and extremely backward. No mobile service is available there. Private telecom companies do not want to go to such areas, since they cannot mint money there. Hence, Government has taken a decision that BSNL should go to such areas and provide mobile service. Certainly, as a government company, BSNL has to undertake this responsibility. At the same time it cannot expect to earn any profit in these areas. In the similar fashion, BSNL is providing land line services in the vast rural areas of the country, as per the directions of the government. BSNL incurs thousands of crores of rupees loss due to this services. Two years back BSNL floated a tender to procure mobile equipments for 93 million lines. In that tender process, Hua Wei emerged as the lowest bidder for South and West Zones. When the purchase order was about to be placed on Hua Wei, Home Ministry objected to it. Installation of equipments by Hua Wei, which is a Chinese company, could create security risks, said Home Ministry. At the same time, private companies were freely allowed to purchase equipments from Hua Wei. The argument of Home Ministry was that, BSNL being the State owned company, government has to depend upon it for communication services, in times of internal and external emergencies. Hence, Government could not allow a Chinese company to install equipments for BSNL, since they could install ‘spyware’ along with the equipments, said the Home Ministry. This was one of the reasons due to which the 93 million line tender was cancelled. From the above instances it is clear that being a Government owned company, BSNL has to function under certain restrictions and also it has to carry out certain social obligations. These restrictions and obligations are not there for the private companies. Due to this reason, BSNL is denied of the level playing ground. It is unfortunate that the Government refuses to recognise this fact. It wants to treat both BSNL and the private companies on an equal footing. Government persues this policy under pressure from the World Bank, Multi National Companies etc. It refuses to give any concession to BSNL, considering the handicaps that the latter is suffering, being a State owned Company. How the Government expects BSNL to run the race with it’s one leg tied. This policy of the Government, towards BSNL, seriously hampers the viability of the latter. In fact this is an anti-BSNL policy. Government has to change this policy. Otherwise we have to compel the Government to change it. IDA from July 2012: The CPI (IW), which was at 201 for the month of March 2012, increased by 4 points and stood at 205 in April 2012. Even if there is no increase in CPI (IW) for the month of May 2012, the IDA is set to increase by 4.5% from July 2012.